Each year, Associated Students faces the difficult task of dividing a budget of several millions of dollars, all of which the student body procures through the Student Activity Fee. Despite a clean and transparent process conducted by A.S. Council and A.S. President Daniel Juarez when establishing the budget, there are items that deserve to be analyzed further. For the first time in several years, A.S. Council came out of their budget meeting declaring a surplus of over $6,000 out of the $5,171,256 that the Student Activity Fee puts at their disposition. We applaud the council’s decision to disclose the full version of its budget, and we would like to remind all readers that although the sums mentioned can seem preposterous, all come down to a few pennies per person. A.S. Council rightly allocated money to different entities that feed directly back into the student body. The budget pledges $36,000 to A.S. Safe Rides, in a continuing effort to ensure all students get home safely. $3,000 were pledged to the Student Organized Voter Access Committee, which attempts to help all eligible students sign up to vote. Juarez said that for the first time, UCSD led all UC campuses in the total number of students registered to vote, proof of the effectiveness of programs such as SOVAC. The Council also dedicated $34,200 to the Food Pantry, looking to help the estimated 42 percent of UC students who are food-insecure, according to UCOP. The New York Times’ Collegiate Readership Program, which certainly benefits campus, costs students $5,775 a year, and must be advertised more on its first year back on campus. A.S. Council also allocated funds to impactful programs that receive little to no recognition. The Triton Lobby Corp, for one, was pledged $3,000. 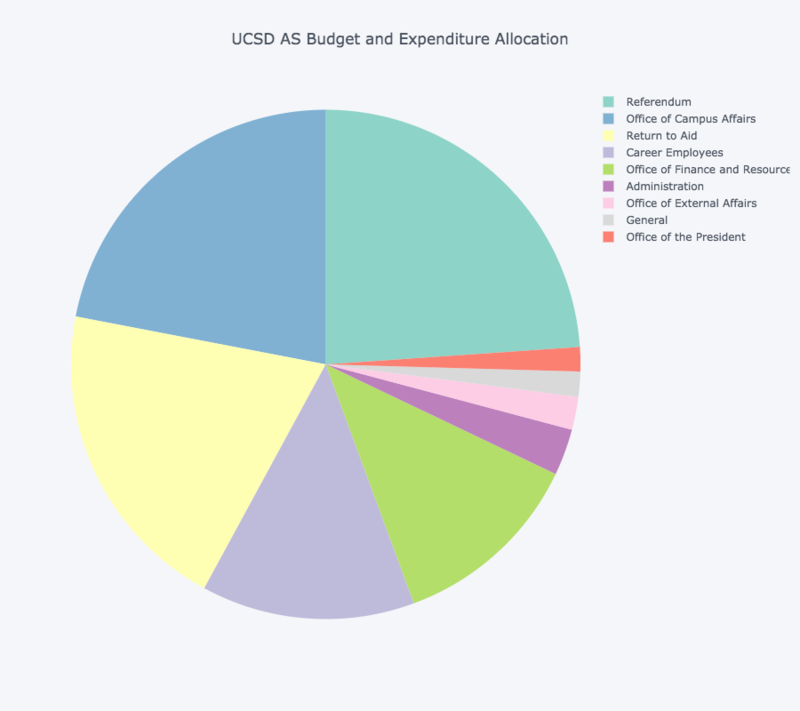 Although many students could think that a group lobbying for UCSD seems superfluous, Juarez assures it helps show our voting power to force both the state and the UC system to take notice and advocate for students. Another item of contention on the budget was the doubling of the senators’ stipends, which Juarez justified by saying it encourages people from low incomes to apply to student government positions. Juarez also stressed that more money leads to more accountability, with meeting attendance now being closely monitored and financially incentivised, a measure all of us at the Guardian can only applaud. Everything, however, is not all pink and rosy. We don’t think all students would approve of one-fifth of their student fees going to the Office of Concerts and Events — nearly three-fourths of which is allocated toward Sun God alone. We don’t find it appropriate, either, that the student fees cover the travels of the President and the A.S. Retreat, regardless of whether or not it successfully develops leaders. It is also questionable that student fees should pay for salaries of University Center employees, which amount to almost $700,000, even if those employees provide services directly to students. We understand it is a strenuous task to deal with allocating such a sum of money, but students have a voice in the process and should be interested in knowing where their money goes to. One last point of contention: Maybe A.S. Council should be raising some of the funds for their “personal expenses,” instead of digging into the budget just because it is big enough to satisfy their needs. However, overall, we think our student government made sound choices and deserve praise for conducting a transparent process. The pie chart representing A.S. Council’s budget for the upcoming academic year has been updated to reflect the correct total of $5,171,256 derived from the Student Activity Fee. The last two paragraphs should be highlighted as a separate issue. What does “Referendum” mean, and why does it consume 19% of the budget?